It’s no secret that I am partial to the corner of World Showcase that includes France, Morocco, and Japan. Not only is the architecture gorgeous, with the spirit of the lands exuding from every corner, but the galleries and films feature thoughtful perspectives on their people and cultures. Oh, and did I mention the dining available in these areas offer some of the best fare on property, particularly when comparing the quick service offerings to the options available elsewhere. Today we’ll focus on the Tangierine Cafe. 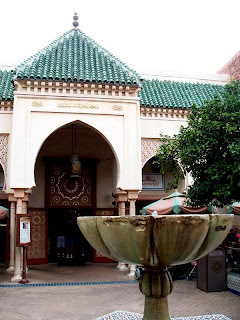 While right off of the main thoroughfare of World Showcase, the Tangierine Cafe offers a variety of seating. For the people watching crowd, there are several tables where this pastime can be practice while enjoying the savory dishes. There is also seating in the main dining, ordering, and preparation room complete with the feel of a hustling marketplace. For those seeking some solitude, there are also a few quite tables near the back, the perfect environment in which to totally engross yourself in the dining experience. And an experience is just what is on the menu at the Tangierine Cafe. While World Showcase tirelessly tweaks menus in an attempt to offer traditional fares, for the most part, guests have some history from which they can venture into new territory, egg rolls, fish and chips, pasta, or noodle bowls. In Morocco, however, most palates are unaware of the flavors and textures that they could be presented with. While this may be seen as a detractor to some, for those wishing to broaden their horizons, this is a delicious first bite. On our last outing my wife and I ordered a Vegetable Platter and a Shawarma Platter with Chicken. My dining habits are very established, I try a bite of everything on my plate and then make my way through the dishes from my least favorite to the most tempting. 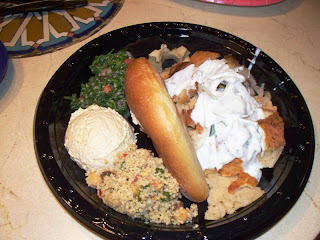 My chicken shawarma, however, left me in a befuddled state as I could not pick the most appetizing item on the plate, which included the chicken with the side dishes of hummus, tabouleh, Tangierine couscous salad, and a piece of Moroccan bread. Everything on the platter, and I do mean everything, left me wanting seconds. If I had a trouble deciding between my various sides, my wife had an even trickier time deliberating over the various elements of the Vegetable Platter. 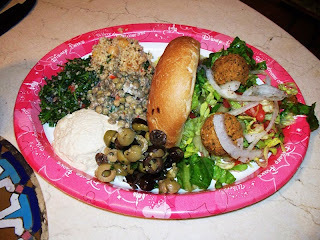 Piled high with falafel, tangierine couscous salad, hummus, tabouleh, lentil salad, and marinated olives, this meal was a feast for the palate as well as the eyes and nose. If there is one drawback to the Tangierine Cafe, it is the menu prices. A typical meal can range between ten to fourteen dollars. While the expense for a single entrée may seem steep, the ample amounts and variety of items included in with each meal more than justify the cost. At the end of the meal, no one should feel hungry, and everyone will have found a new must-have dish for trips to World Showcase. Tangierine Cafe? I would never have guessed that. Now perhaps Mrs. Doc and I will have to stop in for a sample. Tangierine Cafe always gets huge marks from everyone I speak to. Great food, large portions, good variety. Plus, that place is absolutely stunning. If anyone wants to practice their photography, head over to the Tangierine Cafe at sunset and capture some rays coming through those beautiful stained glass windows. I have photographed there in daylight and at night, whay have I never thought to capture the evening! I am making a note to do this during Marathon Weekend... plus it gives me a reason to head back to eat there again!